On Wednesday, September 30, I flew back to Johor Bahru in the Mooney to purchase the fuel that I couldn't obtain at any airport in Singapore that had a long enough runway for my departure to India. The flight to JB only took a few minutes, but before departing I was "encouraged" by my handlers to obtain a security briefing from Singapore's aviation officials. That short briefing outlined the strict confines of the airspace environment around the tiny country, and resulted in the officials plotting out for me a very precise flight path from Singapore's Seletar Airport to JB that would avoid the various air defense borders and military practice areas of both Singapore and Malaysia. In the end, I was happy to have this information. Given the way Singapore punishes its graffiti artists (flogging! ), I could only imagine how a negligent civilian pilot breaking military rules might be treated! Upon arrival over the JB airport I was asked by the tower controller to circle for awhile, as the airport was temporarily closed for a VIP landing. Sure enough, within a couple of minutes a baby blue Gulfstream jet appeared and landed, disgorging its principal passenger, one of Malaysia's Sultans (there are five of them in total). As soon as a motorcade with flashing police lights wisked the monarch off to his nearby palace, I was cleared to land. After checking into my hotel near the JB airport, I arranged with the concierge for a private tour of the local area. I had never before been to Malaysia, and I planned to use my one day there to maximum educational advantage. I was immediately introduced to limousine driver and erstwhile tour guide, Fadzil Bin Daud. A devout Moslem, Fadzil offered to not only show me the sites, but to also take this golden opportunity to show his American visitor that "not all Moslems are bad." I never thought of myself as particularly anti-Moslem, but I was delighted to accept the challenge! Fadzil was a retired Malaysian military officer who demonstrated quite a worldly view of things as he drove me around the JB area. I tremendously enjoyed our few hours together, and I hope we will be able to stay in touch for many years to come! 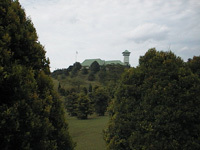 Shown in the distance is the palace of the Sultan near Johor Bahru. This is as close as I was allowed to get to the tightly secured site. Malaysia retained five of these local monarchs when it consolidated their realms into a single nation back in 1964. 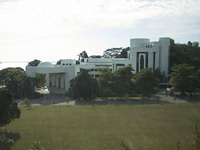 The sixth one, the Sultan of Brunei, elected to remain an independent member of the British Commonwealth, and serendipitously for him oil was later discovered in Brunei. The Sultan of Brunei and his tiny nation are now among the world's richest, while the territories that had previously merged to become Malaysia remain economically disadvantaged. Still, Malaysia passes along a portion of its tax receipts to each of these monarchs, who maintain opulent palaces and lavish lifestyles despite the less fortunate circumstances of the citizens around them. Malaysia has become much more modernized in recent years than many westerners may be aware. Here's an example. 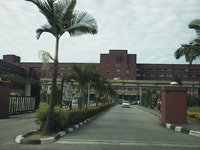 This is a view of a large state-of-the-art hospital located in downtown Johor Bahru. My guide Fadzil insisted on giving me a view of what it's like living in a "nonviolent and peace-loving" Moslem nation. One of the stops we thus made was to visit this mosque in JB. It is over 100 years old, but is still in daily active use. Worshippers lined up in rows on the massive rug inside for one of the afternoon prayers, and Fadzil remained with me just outside the main interior chamber translating the chants as they were read on the loudspeaker. Indeed, the prayers spoke only of care for one's neighbor and the desire for peace among all peoples. Fadzil explained that Moslems believe in the importance of personal cleanliness, both of mind and body, before facing God in the mosque. 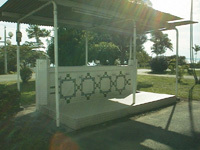 This wash stand is located just outside the mosque so worshippers can rinse off their feet after removing all footwear in preparation for entering. 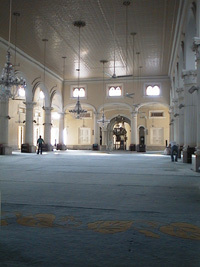 A view inside this massive religious structure. 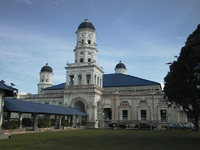 The Moslem Court building in Johor Bahru. Malaysia's citizens practice a wide variety of religions, so a considerable effort has been made over the years to separate the functions of church and state. Among other things, that means that Malaysian civil and criminal courts will not address violations of strictly religious laws. This court will, however, for local Moslems. The most common cases decided here involve domestic issues. As an interesting side note, Fadzil explained to me that a Moslem man can have up to four wives, provided that all four are treated equally. The interpretation of "equally" apparently leads to many a case in this court building! 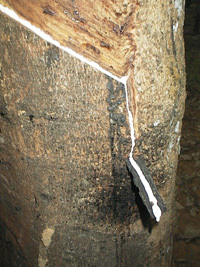 Rubber plantations still pepper the Malaysian landscape. Women arise at 5am in the morning to set out their collection cups, so that latex sap can be harvested before the afternoon sun hardens the material. Fadzil showed me how just peeling a solidified strip of yesterday's sap from an inclined collection cut in the bark will start a new flow of the white raw material used to manufacture rubber. You can't escape the unhealthy eating habits of the western world, even in Malaysia! 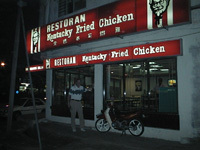 The menu was classic Kentucky Fried Chicken, although the Colonel's famous recipe of spices had obviously been altered to suit the local tastes. 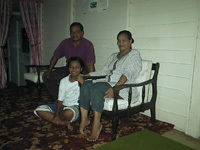 Tour guide Fadzil Bin Faud, his daughter, and his wife at their home. He was kind enough to invite me over to meet his family following our tour. Two of his children were not present when this picture was taken, although they dropped by later after work to greet me.